This week, we hear from faith-based organizations about why they’re so active in the climate justice movement. We also learn what lessons and techniques reporters need when a natural disaster strikes—disasters like the massive flooding that hit Calgary last summer. Finally, two short stories exploring wintery themes: discover frostbite’s sway on history and what makes snowflakes unique. Update: this episode was remixed with new content on Tuesday, 11 February 2014 at 9 pm MST. Earlier this month, representatives from nearly 200 countries met in Doha, Qatar for another round of global climate talks. 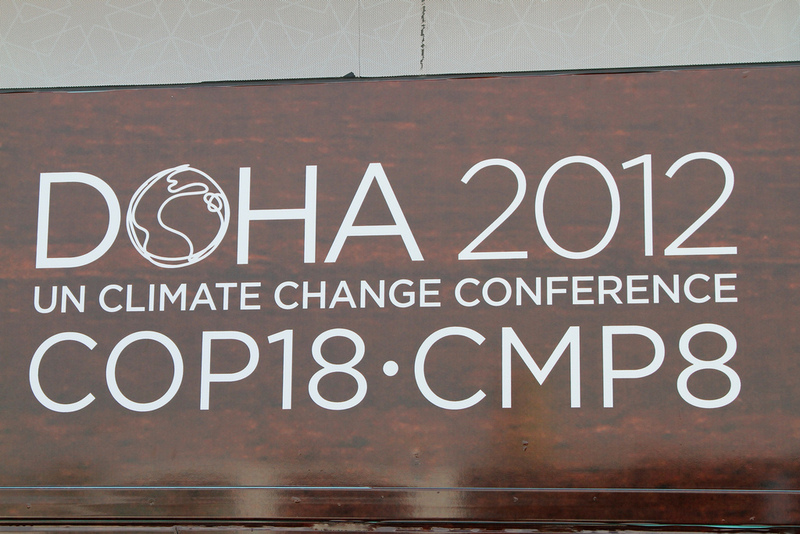 It was the 18th Conference of Parties of the United Nations Framework Convention on Climate Change. The gathering included politicans, diplomats, scientists, NGO workers, and youth delegations from across the world. As the talks closed on December 8th, delegates agreed to extend the Kyoto Protocol for another 8 years, until 2020. But the signatories of this second phase only account for 15 per cent of global greenhouse gas emissions. Canada, Japan, New Zealand, and Russia have all opted out. The United States never joined Kyoto in the first place. Join us as we navigate the murky waters of global climate talks. Our guide will be the Canadian Youth Delegation, the group of ten sent to Doha to represent a civil society voice at the talks. Most of the audio for this week’s show is pulled from their recent podcasts, produced by Nadia Kanji. Environment Minister Peter Kent officially withdrew Canada from the Kyoto Protocol last week, only hours after returning from the UN’s climate changes negotiations. The NDP’s Laurin Liu weighs in on the issue and explains what it was like to be in Durban for the COP17 climate talks. We also take a look at passive solar heating solutions you can add to an existing home and talk to community gardeners about why they just can’t stay out of the dirt. The Cumberland Power Plant in Tennessee. Photo by Roger Smith. Environment Minister Peter Kent dropped a diplomatic bombshell last week with the announcement that Canada was pulling out of the Kyoto Protocol, the international treaty designed to cut greenhouse gas emissions globally. In making the announcement Minister Kent argued that Kyoto was ineffective, given that large developing countries including China and India faced no firm limits on emissions. Furthermore, Canada was so far off its target that failure was all but inevitable. Canada is now the only country to have pulled out, sparking criticism from China, India, Germany, small island states and others. Critics in Canada worry that such a move weakens out ability to influence further climate negotiations. The minister, however, claims that Canada will play a constructive role in further international negotiations, but only on a new treaty. Deputy Environment critic Laurin Liu from the federal NDP shares her thoughts on the issue. Here in icy Canada, trying to reduce your home’s energy use in wintertime can leave you and your family in the cold. Keeping your house warm without fossil fuels or extra electricity is possible. Today, Brett Tegart takes a look at passive solar heating solutions you can add to an existing home, and at a new technology that could generate electricity using the windows in your house. All across the country people are getting their hands dirty. Vacant lots, old rail right-of-ways, and unused corners of city land are getting a make over as community gardens reclaim the lost space. These days just about every major city in the country has a garden, and they’re so popular that many are struggling just to find room for all their new members. What’s all the fuss about? Steve Andersen fills us in. Canada pulls out of Kyoto: Hours after returning from the UN climate talks in South Africa last week, Canadian Environment Minister Peter Kent announced the federal government will withdraw from the Kyoto Protocol. Chinese and UN officials immediately urged Canada to reconsider – as did Japan, which also refused to take on a second round of Kyoto commitments. Quebec announces cap-and-trade system: The provincial government has decided to introduce a cap-and-trade system for carbon emissions, making them the first Canadian province to do so. This system, which creates a market for pollution control by providing incentives for emissions reductions, is designed to improve flexibility, fairness and efficiency in regulating the production of carbon. Ontario’s polar bears are in dire straits: The impacts of climate change are far reaching, and one impact is hitting closer to home. The warmer weather is changing the ice patterns which in turn is making it harder for the polar bears to find adequate food to survive. Ian Stirling, the well known scientist who has studied polar bears for the last several decades, warns that 40 years from now their likely won’t be many bears left in the Hudson Bay area. Bruce Power withdraws plans for nuclear power plant in northern Alberta: The Ontario-based company had proposed sites near the town of Peace River for a 4000 megawatt plant. CEO Duncan Hawthorne said the company instead wanted to focus on its Ontario operations for now. Peace River’s mayor Lorne Mann said he was disappointed at the news. The Cancun climate talks wrapped up with a late night agreement after a week which left most skeptical about the possibilities for international cooperation at the UN level. In an effort to gain a deeper insight into the process and outcome of the Cancun negotiations Terra Informa correspondent Myles Curry interviewed environmental activist Russel Charlton & NDP MP Linda Duncan as they left Cancun from two different international conferences on climate change. This week Myles spoke with New Democrat Environment Critic and Member of Parliament for Edmonton-Strathcona Linda Duncan from the morning after the conclusion of the Cancun conference. Last week we aired part 1 in a two part series brought to us by Terra Informa correspondent Rebecca Rooney. Back on December 3rd, she recorded a talk titled Measuring the Effects of Oil Sands Development on the Athabasca River Ecosystem, delivered by Dr. David Schindler. Dr. David Schindler is the Killam Memorial Professor of Ecology at the University of Alberta. His recent research has concluded that oil sands extraction and upgrading north of Fort McMurray does contribute to the contaminant load of the Athabasca River. This research clearly demonstrates that contamination from oil sands extraction and upgrading can be detected up to at least 50 km away. In part 1, he focused on the increase in toxic metals and hydrocarbons in the snowpack, in tributaries, and in the main Athabasca river and the reasons why the data collected by Alberta Environment and by the Regional Aquatic Monitoring Program (RAMP) has historically failed to detect this contamination. In part 2, he focuses on Polycyclic Aromatic Hydrocarbons, often called PAHs, and associated deformities in fish. We pick up where Dr. Schindler left off, explaining how he was able to achieve more sensitive measurements of PAHs than Alberta Environment or RAMP, using a new sampling technique. 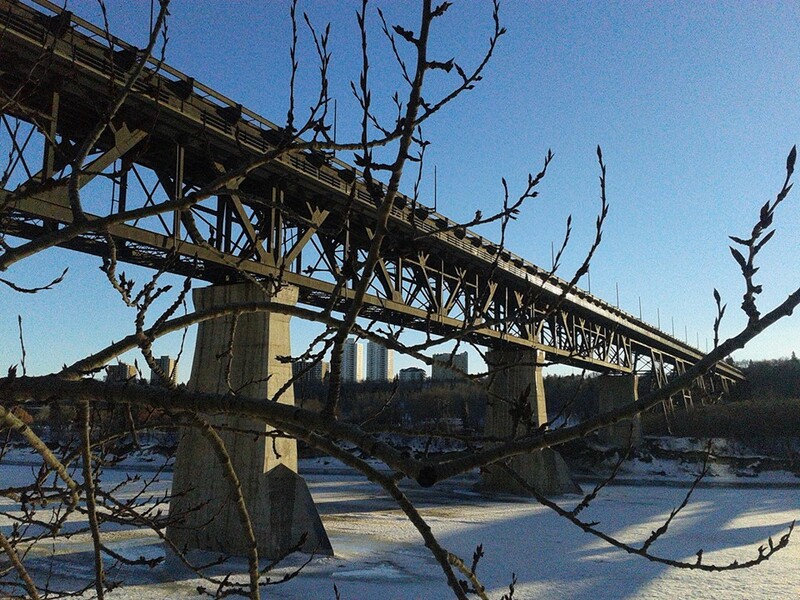 As a consequence of the results of Dr. Schindler’s research, former Environment Minister Jim Prentice launched an independent review of the Regional Aquatics Monitoring Program (RAMP), the program that currently monitors pollutants in the Athabasca river. 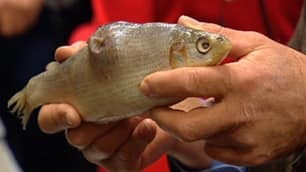 That panel was due to report on its findings to Environment Canada by the end of November, but has yet to file its report. 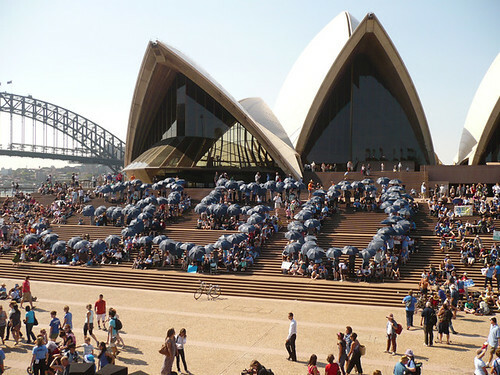 Saturday October 24th was the International day of Climate Action, when over 4000 actions took place in over 170 countries around the world to urge political leaders to adopt binding emissions targets at the upcoming United Nations Climate Change Conference, set to take place this December in Copenhagen. Right here in Edmonton, we had our own Climate Action. Terra Informa correspondent Rebekah Rooney interviewed two of the Edmonton Organizers and reports about the Edmonton Event. 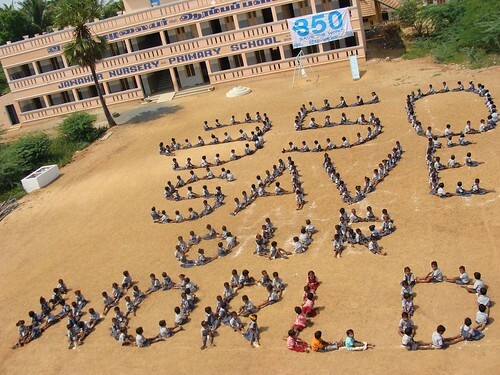 School children in Vilandai, India sit to spell out the words "350 Save Our World" in their school courtyard. Last month Edmonton opened a brand new waste management facility. It’s located on the edge of the city, right next to the old Clover Bar landfill. But the two operations don’t share much in common. In fact, the new building shows just how far the city has come in the way it deals with garbage. The facility separates waste into different streams for composting, recycling, and biofuels production. And if everything goes according to plan, it will allow the city to divert 90% of its garbage from landfills. Well, naturally, we just had to take a look! Here’s Garry the Garbage Guy showing Terra Informa’s Steve Andersen around the new facility. 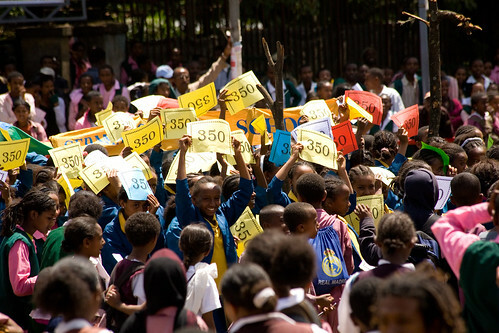 ADDIS ABABA, Ethiopia: Schoolchildren raise 350 signs high above the crowd during a massive 350 March and rally. Organizers estimate attendance at 15,000. Bill C-311 or the Climate Change Accountability Act was originally tabled in October 2006 but due to falls of government the bill did not achieve royal assent despite reaching the Senate. On February 10, 2009 it was reintroduced as a Private Member’s Bill, renamed as Bill C-311. John Harvey interviews Linda Duncan, one of the bills loudest and most passionarte advocates. Alberta’s solicitor general is defending controversial remarks he and the premier made about Greenpeace protesters, saying the comments were not an attempt to influence legal proceedings. A city committee will start to refine its lawn chemical bylaw today, making a decision on how far it wants to go in restricting the use of the products on public and private property. A city survey found 18 per cent of Calgarians strongly support restrictions, even if it results in more weeds on their lawn, while 23 per cent strongly opposed restrictions. As well, 30 per cent think pesticides are extremely harmful to the health of Calgarians, while 27 per cent perceived them to be slightly harmful or not at all harmful. Many world leaders are already committed to negotiating an agreement in Copenhagen that is ambitious, fair, and binding, and many have started implementing solutions in their own countries. Unfortunately, Canada is falling behind. Our national targets for reducing greenhouse gas emissions have been called ineffective, and our performance at a number of recent climate meetings has been labelled “obstructionist”……..
Our inaction comes from fear. Because Canada is a major oil producer, politicians and some businesspeople are afraid that reducing our reliance on fossil fuels will harm the economy. But that’s short-sighted. If we continue to rely on dwindling non-renewable energy supplies, we’ll be left in the dust as the rest of the world moves forward to a green economy, with innovation, jobs, and money from new technologies such as renewable energy infrastructure……. As a northern nation, Canada is particularly vulnerable to climate change. The impact is magnified near the Earth’s poles, largely because of the loss of ice and snow coverage. Canada also has the longest marine coastline in the world, so sea-level rise would have a dramatic effect with enormous economic consequences. Many Canadians are already feeling the sting of climate change, especially in the North and in other communities that depend on forestry, fisheries, and agriculture……..
We can all take individual action to reduce our emissions, but ultimately, we must let our leaders know that we expect them to seize the opportunity in Copenhagen to create a secure and healthy future for our small blue planet and all the people who share it.